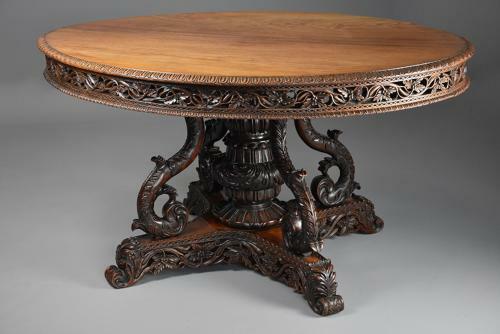 This table consists of a superbly faded solid padouk oval top with carved moulded edge leading down to a pierced and carved frieze of vine leaf and foliate design with a carved moulded edge below. The table is supported by a superb quality highly decorative base of rich patina consisting of a carved central baluster column with foliate carved decoration with four superbly carved foliate and shaped outer supports. This leads down to a quatre-form platform base with a carved and pierced frieze with foliate carving terminating on four scroll foliate carved feet. This style of leaf carving is often found on pieces of furniture from the Bombay region of India dating to around 1850-1860, similar types of 'leafy vine' carving can be found in the book 'Furniture From British India And Ceylon' by Amin Jaffer, page 341 etc.